Pinfest 2014 starts tomorrow and will feature The Walking Dead Pinball and Pinball Machines for sale! 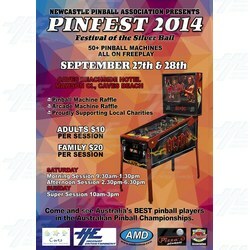 Pinfest 2014 Festival of the Silver Ball is a pinball festival run by the Newcastle Pinball Association and aims to bring pinball lovers and players together for a weekend of pinny action! The event will be held over 2 days: featuring over 50 Pinball Machines on display, Pinball Machine raffles and Arcade Machine raffles, with all proceeds going to charity. This year there will be even more special features and experiences over the weekend, including Stern's latest "The Walking Dead" Pinball on display (first and only in Australia) as well as a variety of Pinball Machines available for sale. This pinny has been air freighted into Australia and is the first and only model in the country. This exciting new pinball will be on display during Pinfest this weekend and attendees will have the chance to play this exclusive machine. We are very excited about this machine and to see it on our shores, Gary Stern of Stern Pinball Inc has said "I am more excited about this game than I have been about a pinball machine in years. This game captures the world of The Walking Dead with brilliant art and great playfield mechanical toys" . Fans of the TV Show and pinball machines alike will enjoy this latest pinny, be sure to give it a test run. We have just received news that there will be 6 - 10 pinball machines available for sale over the weekend. The titles of the pinball machines, the pricing and condition of the machines have not been disclosed, but with the limited pinball machines available in the market at this present moment they wont last long. If you are interested in buying a pinball, make sure to arrive at Pinfest early to get more details and see whats on offer. Pinfest will be held from the 27th - 28th of September at Caves Beachside Hotel, Caves Beach. Adults entry is $10 per session and Family entry is $20 per session. Saturday times are 9:30am - 1:30pm and 2:30pm - 6:30pm, Sunday time is 10am -3pm. There will be over 50 pinball machines on display all set to free play, pinball machine raffles, arcade machine raffles and more. Pinfest is proudly supported by Caves Beachside Resort, Highway Entertainment, AMD, Pizza N Pinball and Newcastle Pinball Association.